Suitest supports Android TV and Amazon Fire TV devices running Android version 5.0 or later. After setting up an Android TV device you will be able to run automated end-to-end tests on Android TV apps. Android TV devices are operated by SuitestDrive. 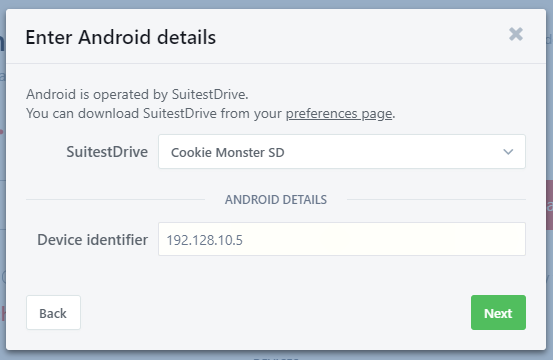 Before adding Android TV device to your Suitest account, you need to pair your SuitestDrive with your Suitest organization. The current IP address is usually displayed on the Network status page of the device. Go to Settings > About > Network and look for the IP address. The location may vary from device to device. Open the Device wizard, select Add physical device, choose Android TV from the platform list and then press Next. On the next screen fill in all the fields and press Next. Suitest will verify that it can connect to your device. When connecting to the device for the first time the device may popup a message asking you to allow the debug mode. Be sure to allow it or else the device will refuse connection from Suitest. The rest of the process will complete automatically. After this the Android TV device will become available in your Suitest account. Suitest will automatically determine the name of the device. You'll be able to change it later on the device management page. Now that you have your Android TV device configured, it's time to instrument your app and start testing. Please check the Android TV troubleshooting section for guidance.